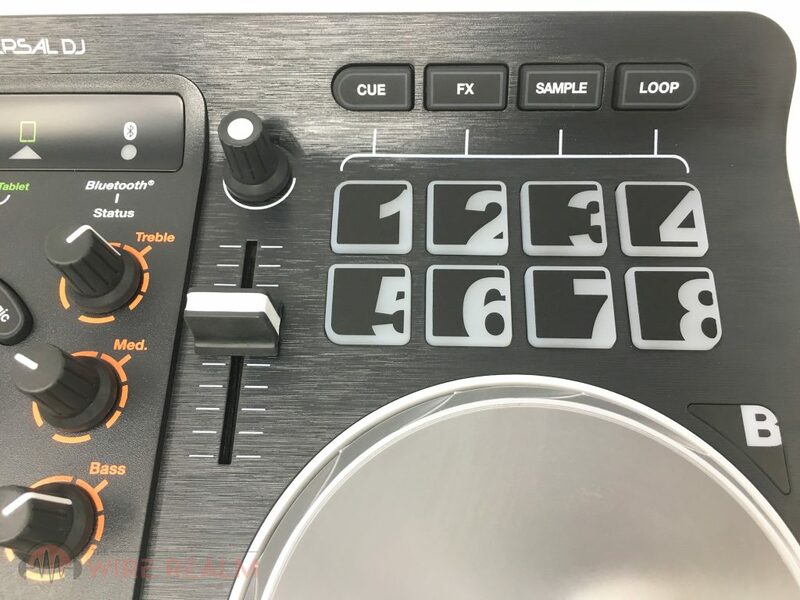 With any DJ controller, we always immediately check out the jog wheels (especially if you’re scratchers like us, but who isn’t with a controller?). These are a nice large size of 11cm diameter, so we can easily fit our hands over them with no problem. They’re made of a harder plastic casing which surrounds the wheels, and the center diameter is of a nice aluminum metal surface. They’re very slick but not too slippery, and with one spin will rotate about two times. Scratching on these for us was not a problem and had a lot of fun with them — no skips, jumps, or problems getting into our flow and groove. They’re a bit less slick than some other DJ controllers we’ve used (especially in the higher range, we’re talking thousands, though), but we were able to get around that and become accustomed to the feel with no problem. Let’s talk faders, knobs and buttons. For one, the master fader is a harder plastic but not necessarily cheaply made — you can also remove each fader and knob easily if you ever need to replace them. You can’t adjust the sensitivity of these internally, but at the price-point that’s not expected. 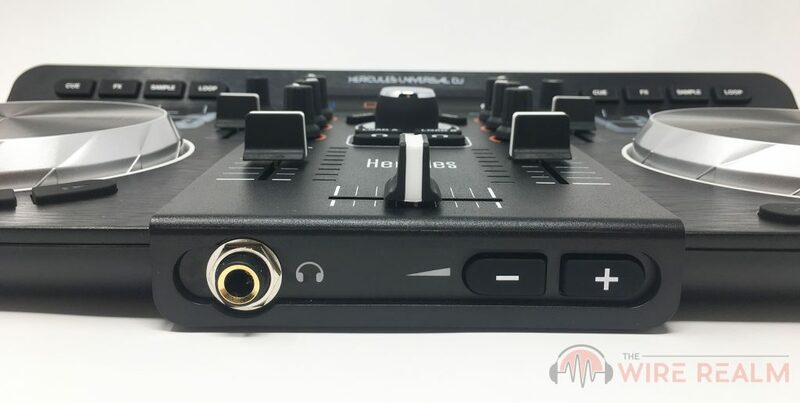 The pitch faders also click once you reach the center of the level, which is a plus to us especially while you’re performing (crossfader and deck volume faders do not). Scratching with the fader was no problem for us, although we typically prefer a tougher kickback, that’s just a personal preference. As for the performance buttons, we were actually really surprised at how nice these feel. They’re a higher-quality pressure-sensitive rubber that have a smooth finish on top, all with numbers that also light up for easy recollection in the middle of recording or a set. We love the quality of the jogs as well as performance pads on this controller. Lastly, the entire unit as a whole to us is sturdy. The casing is made of a rugged, higher-quality plastic and didn’t break at all, even when we tried to bend it to test. 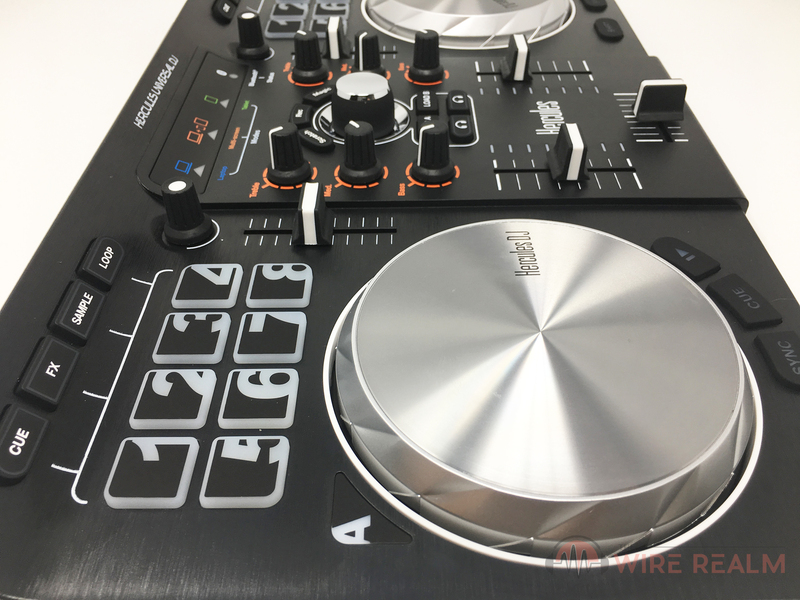 It isn’t necessarily metal or military grade aluminum here, but for the price that isn’t expected as most DJ controllers, turntables and mixers that do come in higher quality casings are very highly priced. This plastic as opposed to metal does help with its weight — we’ll easily be able to carry this thing around to gigs (weighs exactly 3.3 lbs — this is extremely light compared to others). 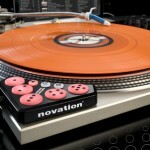 Alongside this casing you have a scratch-brushed finish on the decks and matte finish on the central mixing deck. When on-the-go, we definitely recommend keeping this safe in some type of carrying bag or at least wrapped around in a towel. 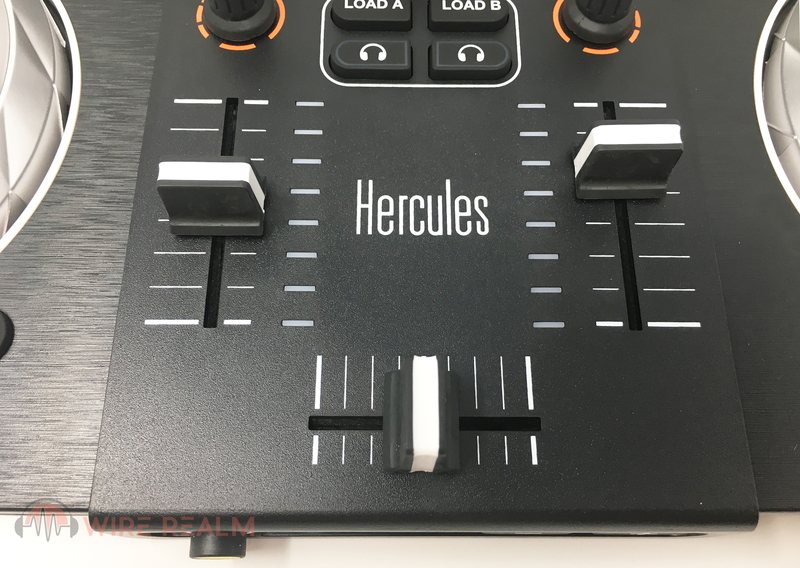 No, unfortunately it does not come with a case and Hercules DJ doesn’t sell any on the side, and it won’t fit in a standard laptop sleeve either since it’s a bit too large. We’d even recommend keeping the original box and traveling around with that instead of just throwing it in the trunk by itself. 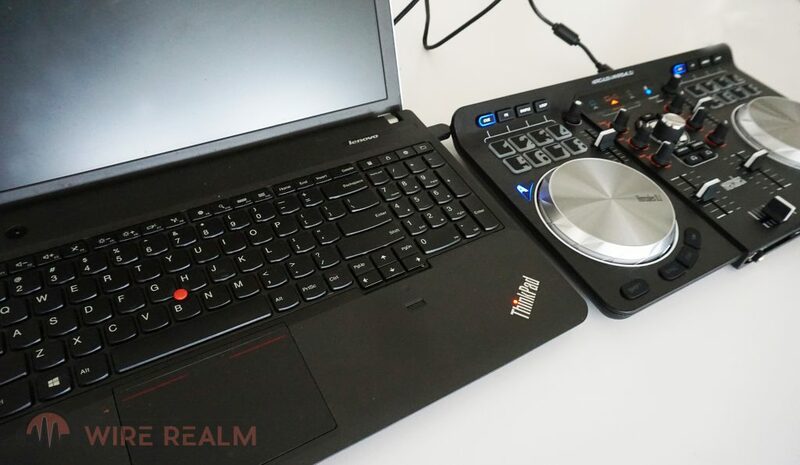 When it comes to getting the Universal DJ going, it’s truly as simple as plugging it in via USB and you’re good to go. Our PC, running Windows 10, immediately recognized the device and to verify, our controller started to flash its lights around the entire unit until finally settling in — no drivers were required to download (we’re pretty sure ‘downloading drivers’ is now a thing of the past). Once we were able to install DJUCED with the CD it came with in the box, the software also recognized the controller as soon as we opened it. 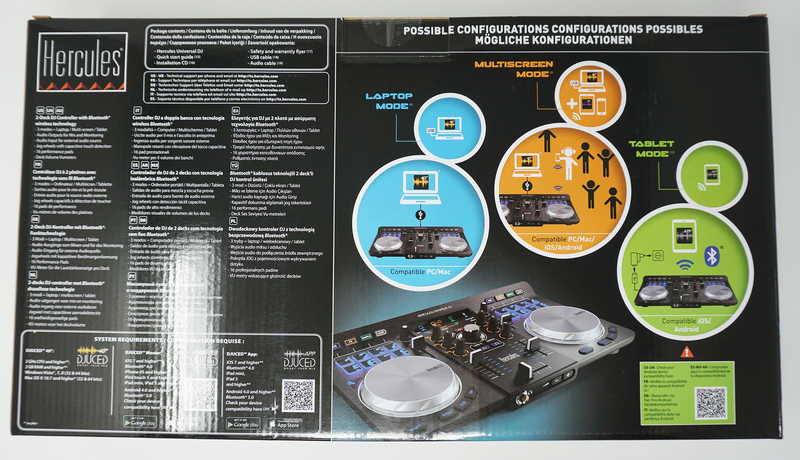 In the Universal DJ box: 1 controller, DJUCED installation CD, quick start guide and poster, USB cable, RCA mini-jack cable. 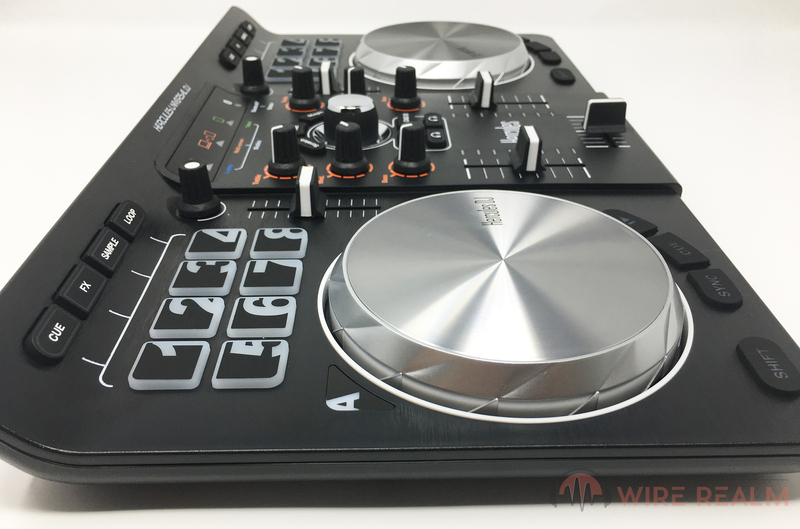 A first big standout feature that make this one special we’d like to highlight is their ‘3 different controller modes’, which pertain to this DJ controller’s versatility in regards to being compatible with multiple devices and platforms. The first mode, “laptop mode”, was efficient for us when connecting straight into our laptop (with speakers as well) — essentially plug and play to get going right when the USB cord is connected (install the DJUCED software first, of course — it comes in as a CD in the box, or you can always download it online). The second mode, “multi-screen mode”, allows us to connect either a PC or Mac as well as an iOs or Android device. You can sync up both the DJUCED 40 Degree software as well as DJUCED app and connect your smart device via Bluetooth (we’ll highlight how those go later on). Lastly, the third mode, “tablet mode”, is for those who are into larger surfaces and not wanting to fiddle with a laptop or PC\Mac. The only catch with this last mode is the fact that you have to power up your Universal DJ with a USB power adapter and it isn’t included, but we were able to use our existing adapter we had lying around we usually use for a charger (then just use the USB cable that comes in the box). You then sync your tablet via Bluetooth and voila, we’re good to go with the DJUCED app for easy use and control remotely. To switch between their convenient 3 modes, just move the switch on the back (green for tablet mode, red for multi-screen, and blue for laptop). Another standout feature we noticed when using the Universal DJ worth noting is the ability to hook up your smart phone or tablet directly into the controller itself for access to any streaming apps you have on hand (Spotify, Apple Music, etc.). We were able to add EQ and even samples to play around with some of our favorite tracks. You can also import tracks in DJUCED in your media library in case you have MP3’s on your PC or Laptop you want to use. To us this may be a bit more reliable if you’re performing or running a set in a club, bar or venue since we’re not 100% confident that streaming won’t be interrupted at least once during a set (hopefully you at least have Wi-Fi). Next up, let’s talk syncing and Bluetooth pairing. Once switched over to ‘tablet’ or ‘multi-screen’ mode, the Bluetooth front interface will start to flash (if it doesn’t, just press that ‘Pairing’ button and hold it for a few seconds until does), and you’ll notice in your Bluetooth device settings of your smart device show ‘DJUNIVERSALMIX’ to pair. Once doing so, you have a lot of room to play with here. 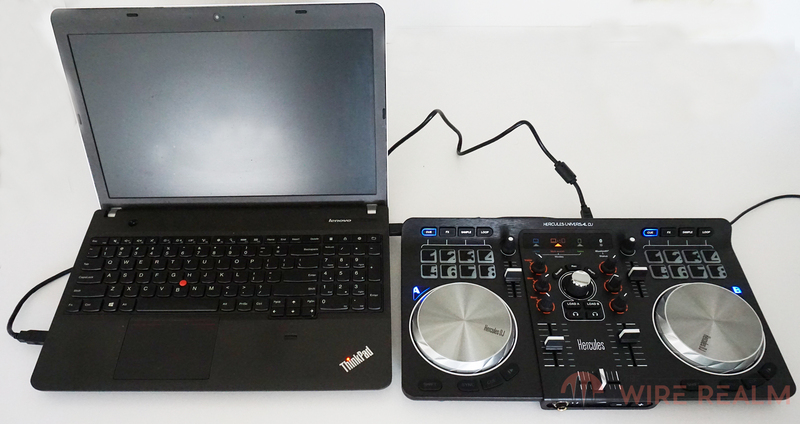 We tested how well the Universal DJ worked with the app and we were surprised at first the lack of latency. For example when using the app and watching it sync with the software on our laptop, sliding the master fader immediately did so in the software as well with no delay. We were also able to play, stop, sync and adjust the time stamps for both decks with the app. Your main headphone in as well as volume control on the front. The ins and outs of the Universal DJ aren’t extremely versatile, but definitely get the job done for this level of DJ’ing. Although it isn’t as much as a thousand-dollar mixer or controller, for the price we’re getting this for we really have no complaints at all, and in our opinion think we get a few of the essentials many beginners as well as semi-pro DJ’s need for a standard digital DJ setup. 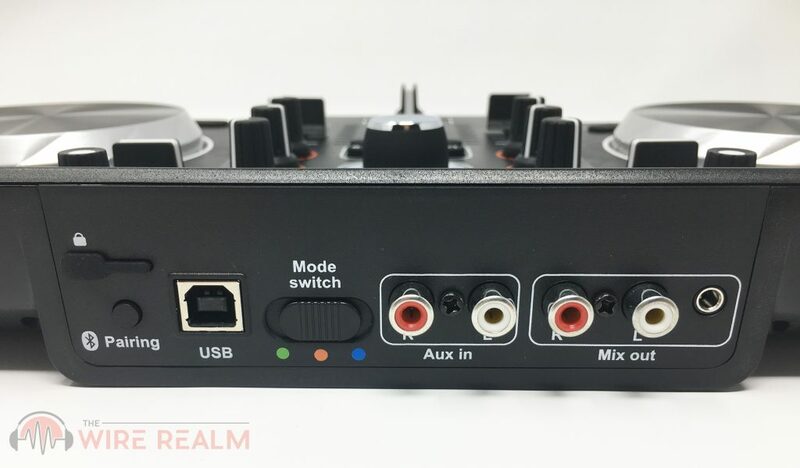 The RCA aux in for channels 1-2 can hook up your monitors at home or studio, or perhaps a PA system if you’re on the go at a gig (or you can always go through your audio interface or computer as well). The RCA mix outs add for more versatility and the 3.5mm allows to hook up your smart device directly if needed. No, we don’t have any microphone XLR ports but you can always use a separate audio interface with some that can also hook up to your laptop or PC — don’t forget, we’re not just limited to what’s on the Universal DJ. Your PC, laptop or smart device can act as a ‘hub’ for many devices, and since this isn’t a completely analog setup, we aren’t limited to just what’s on the controller. On the other hand, those interested in the old-school analog DJ rig won’t have much leniency here. 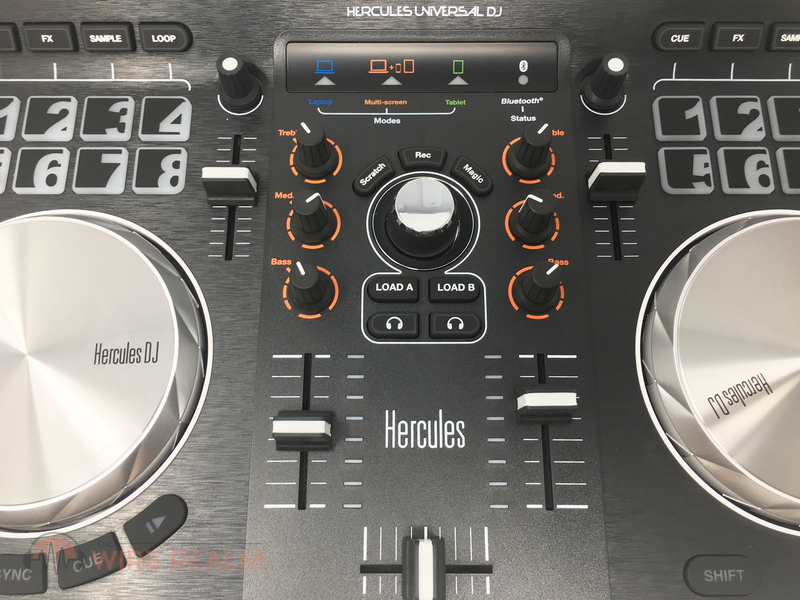 The Universal DJ is indeed compatible with more DJ software out there, however is not nearly as seamless as it is with DJUCED. If you’re OK with getting to know a new software, we recommend keeping these familiar with each other instead of venturing out to let’s say Serato or Traktor. 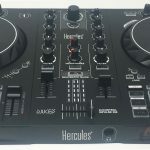 Don’t get us wrong, you can always feel free to do so, but if you want to really tap into the power of the Hercules Universal DJ, DJUCED (software and app) is the way to go. For many looking at this price-point, you may not even have a DJ software yet, which is fine since this will be very effective if you’ve never tapped into DJ software before. When it comes to the DJUCED 40 degrees software itself, there’s a lot of power here and we’ve gotten to know it quite well through out the past few weeks while using this. To summarize, some notable features include a visual interface for both of your decks to mix, add effects, set cue points, create loops, switch up songs, tweak the three-band EQ, and more. You can also import any songs you have at hand on your PC or laptop, create new playlists and sets with these, as well as add some samples and FX on top of it all. There are also nifty features to help keep our sets in tact, especially with their ‘snap’, ‘quantization’ and ‘slip’ features, which all ultimately aid in keeping the mixes rhythm so it doesn’t slip a beat in the middle of a set and completely ruin the flow. 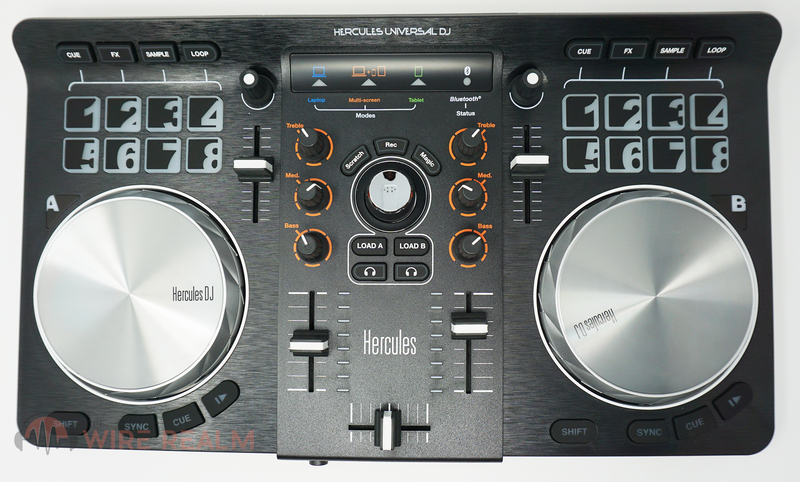 You also have ways to work the software with the controller itself, such as every feature above of course, as well as browse your files and library folders with the Universal DJ controller itself (with the big master knob at the center, you can browse by turning it with a click guide or press it in to select). This syncs with the software very seamlessly, and we had no trouble working it real-time — no lag or latency at all. The software lastly comes with something called ‘Loopmasters’ sample packs which give us out-of-the-box sounds and tracks to start mixing with immediately, not to mention some great Macro FX to play around with our creativity without needing to download or buy any separate sounds or FX. As previously explained, the app can control both the controller and software at the same time. 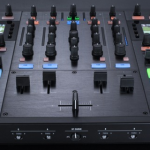 The capabilities here aren’t completely broad but we do have some notable essential controls at our fingertips from your phone or tablet: control your mix as a whole (volume, play, sync for each deck), master fader control, rewind or fast forward for each deck, create loop and FX combos, a “PANIC” button (it plays the next ‘best’ track if you aren’t sure of what to play next), as well as allow people to vote and keep track of stats (with their app’s “party mode”, you can have your audience collaborate with playlists). If you do have trouble syncing the Universal DJ with DJUCED and your computer for whatever reason doesn’t recognize the device, simply go up to the top right and click the ‘settings’ icon, go into ‘audio’, and use that drop down to select the different devices that are hooked up to your computer. 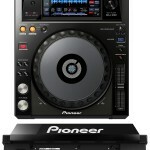 The words that come into mind after using the Universal DJ for more than a week are simply “fun” and “effective”. 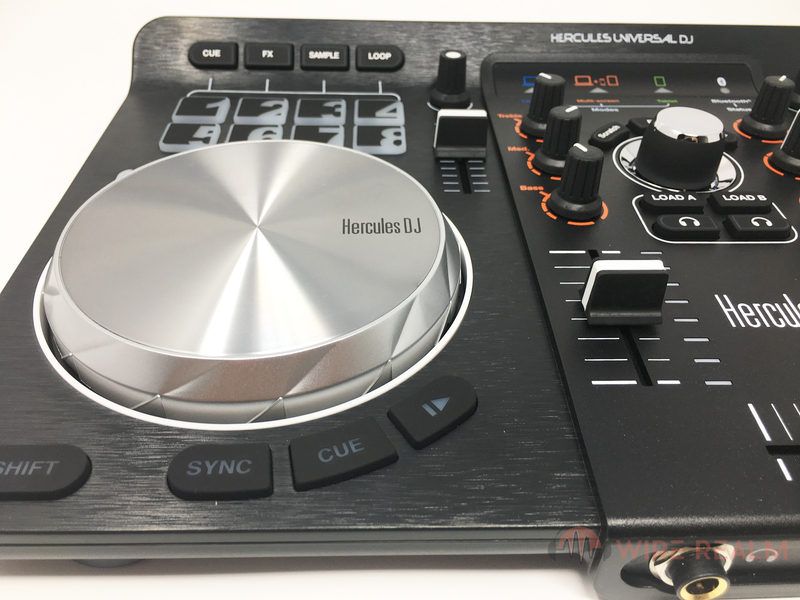 For the price of this DJ controller, it gives many models out there a hard time to compete, especially those that are tailored to not only beginners but DJ’s who need something simpler in their repertoire or want to interact with their audience on a personal level. 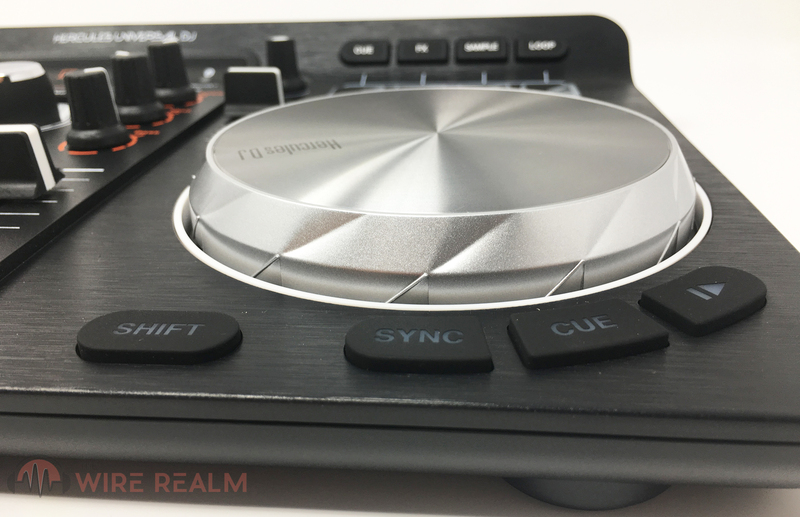 There’s a reason this made it into a few of our popular lower-budget guides, such as the best DJ controller for beginners as well as DJ controllers under $200. You can of course read those articles as well to get a feel for some of the competition, and there are of course many solid DJ controllers in this price-point; however, there aren’t many that have specific features that make the Universal DJ stand out and special, such as the compatibility with pretty much all devices out there via Bluetooth, incorporation of your audience (vote on tracks, create collaborate playlists, etc. ), a very particular software and app to go alongside your mixes (controlling it via your phone so you’re not just stuck behind your DJ rig is huge, unless you don’t like to mingle through out the night), and of course the standard needs with DJ controllers to scratch, use performance pads, fade, cue, sample, loop and more. If you’re a DJ who performs in front of thousands as a career or those that are big into analog setups, you’ll need to go into a higher price-point. 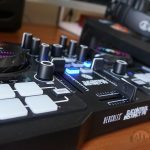 Even those who need a beginner or lower-priced controller, make sure you’ll actually be using the unique app and software (or using the software at all — those with other DJ apps or software already may need something different if you don’t want to use DJuced). 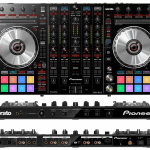 If not, it can be still be a viable DJ controller to learn on, considering the jog wheels and faders are great for scratching and the device can indeed sync with a lot of other DJ software out there, albeit more limited. If you do need perhaps a cheaper and even more mobile (yet more limited in features as a sacrifice), we’ve also recently reviewed their Hercules Instinct P8 if you’d like to check it out. 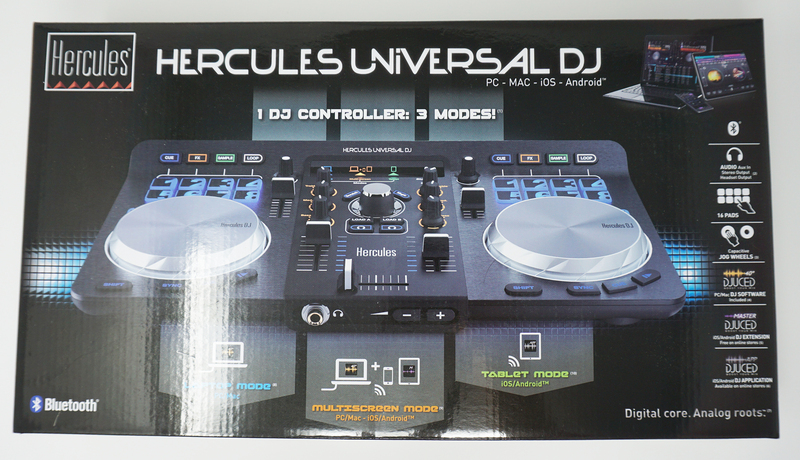 All in all, we’re very fond of the Hercules Universal DJ. It will pertain to a specific crowd out there who think they will actually use the special and unique features that come with it, but if it does, there’s nothing out there quite like it. To switch between their convenient 3 modes, just move the switch on the back.